If your automatic transmission has seen better days, but you can’t really swing for a full-on upgrade, McLeod Racing and Raybestos may offer an excellent solution! Now offering an affordable way to rebuild your automatic gearbox to withstand more power, torque and general racing abuse, this could be just what the doctor ordered! October 30, 2017 (ANAHEIM, CA) McLeod by Raybestos introduces a new line of Performance Automatic Transmission rebuild kits for 500 HP. These kits include a Tan Raybestos Friction Plate that accommodates 500 HP. These are complete overhaul kits which make for a simple one-stop shop rebuild. The kits include world famous Raybestos Tan friction plates, which increase the holding capacity. Also provided are National Oil seals and gaskets for superior sealing capabilities, Teflon coated rings for tighter seals, heat treated plate which is stronger steel than stock to prevent warping, brass filter material for better flow and filtration. This kit comes with 100% new bands. 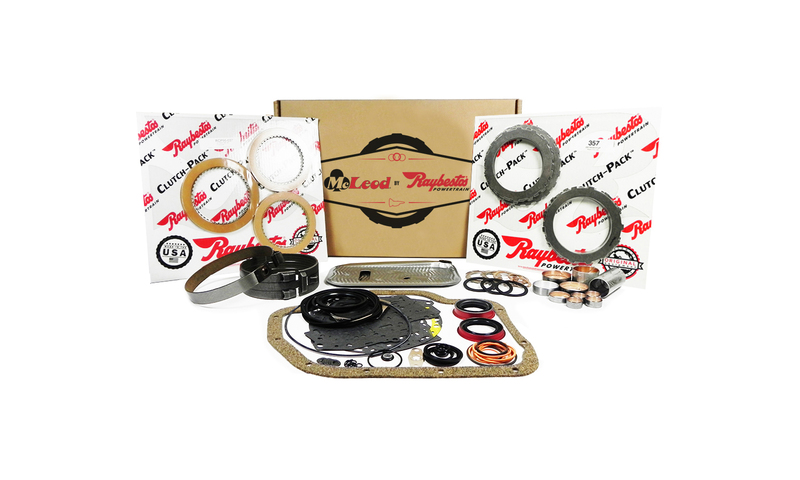 These kits along with the rest of the performance automatic transmission rebuild kits are sold exclusively through McLeod Racing and their distributors.